It was 103 degrees here in beautiful downtown Dexter yesterday so my plan to beat the heat was to stay inside and create a big ol batch of craft paper coin envelopes. Are you asking yourself why????? Because they make the best little books of course!!! Isn’t this just the cutest??? I was able to use lot’s of tags from a Crate paper journal sheet and layered in some Cosmo Cricket and Graphic 45 papers for a totally mix and match pattern style. The fun part was adding tons of chipboard elements , flowers, buttons and yes…that is the new seam binding that arrived from Really Reasonable Ribbon. Every set of pages has it’s own personality. There is plenty of room here to add pictures and journaling. I added lace and buttons to this page. It was really like creating 4 covers. 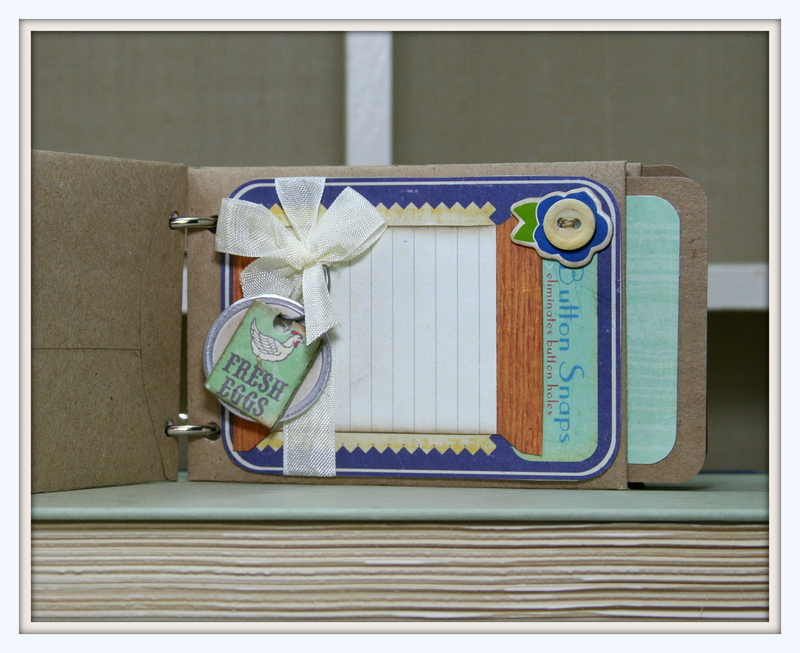 I added quite a few extra layers of cardstock to the centers while creating this book for extra stability. It also gives the little book lot’s of weight and chunkyness. Of look…I’ve made up another craft word lol. Well it looks like another scorcher…so I’ll be at the shop…maybe I’ll have another book to post tomorrow. Glue and Seal???? Can I get that by the gallon???? Every now and then it’s good to get out of your regular routine and do something different. 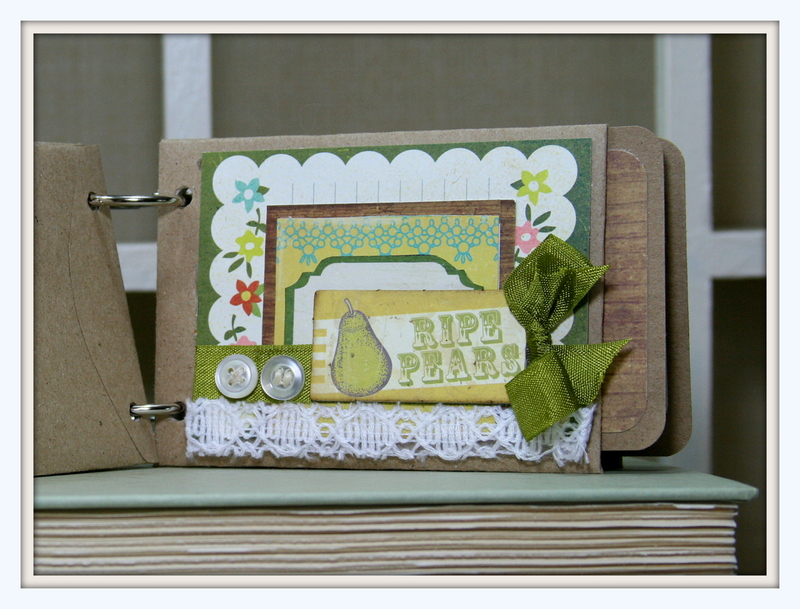 I have to say for me…I do make mostly cards. And that’s okay….but sometimes I just need to shake things up a bit. So today’s creation is a framed project that I made for my kitchen. I was inspired by some pretty plates I found for my large plate rack while on super fun shopping trip with #1 son Alex. I should begin by saying that my workspace is a huge mess now : ) I did a lot of painting, and inking and a whole lot of layering! I used a fair amount of Glue and Seal too! 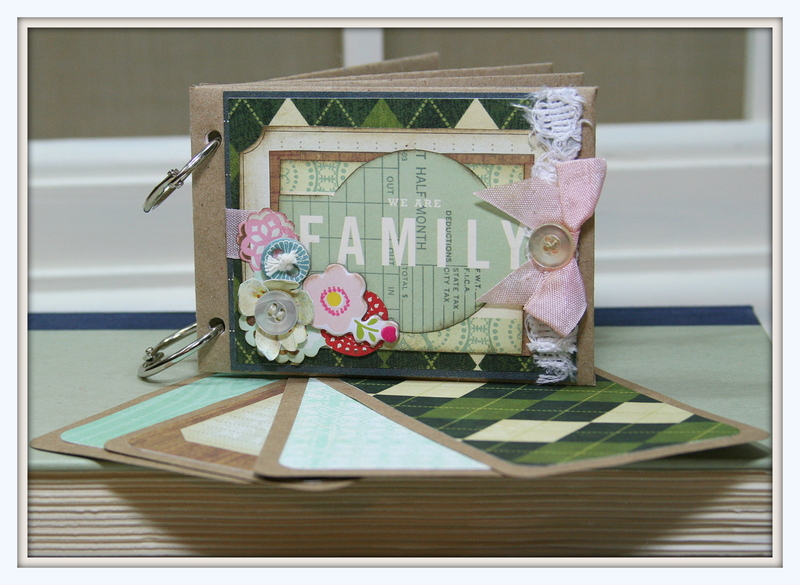 This great die cut Whatnot is from Glitz. I added the butterfly trimmed from a sheet of Pink Paislee paper and a spring rubon. Loving the inked layers. The flowers were from a sheet of Webster’s Pages. These trimmed flowers are also from Glitz. They got a dry brushing of paint to tone done the intensity. The very subtle sheet music image is from Graphics Fairy. Once it was given the dry brush treatment it became the perfect backdrop for this pretty spring rubon. Can you see the book pages in the background? That was another layer sealed in with the Glue and Seal. The Eiffel Tower is from a sheet of My Mind’s Eye paper. More rubons on the corner. I tried to get a few more wrinkles in to catch the inks…but I was being impatient and continued to work with wet layers. I settled for a nice spritz of Perfect Mist in Patina Blue. While I was creating this card last week I kept thinking to myself ” Ginny you should really wait for your shipment of seam binding from Really Reasonable Ribbon to finish it off” But as I am an impatient crafter I went ahead and finished it with what very obviously was the wrong ribbon. I set it aside and waited for my delivery…and yesterday I took it apart and re-made it with the proper pretty pink trim. Lesson learned???? Trust your instincts and save yourself some extra work. These sweet vintage images came from Graphic’s Fairy. I layered them over a shabby die cut from Glitz. Careful placement hides the large number in the center. I used a bit of Picket Fence Stain to soften the image. There is one inked doily…cut in half to soften the edges. Mismatched vintage buttons are the perfect simple accent. I love how this seam binding stays crinkly when you wrinkle it. Don’t forget you can use your Distress Inks and your blending tool to tone down the brightness of your trims! So happy to have my boys back from camp. I’m really used to our crazy chaotic energy and schedule so when my home peeps are gone it is tooooo quiet. This morning they are sleeping in and I was chillaxin then I realized I almost forgot to post my card lol. This card has moved into the new favorite position. 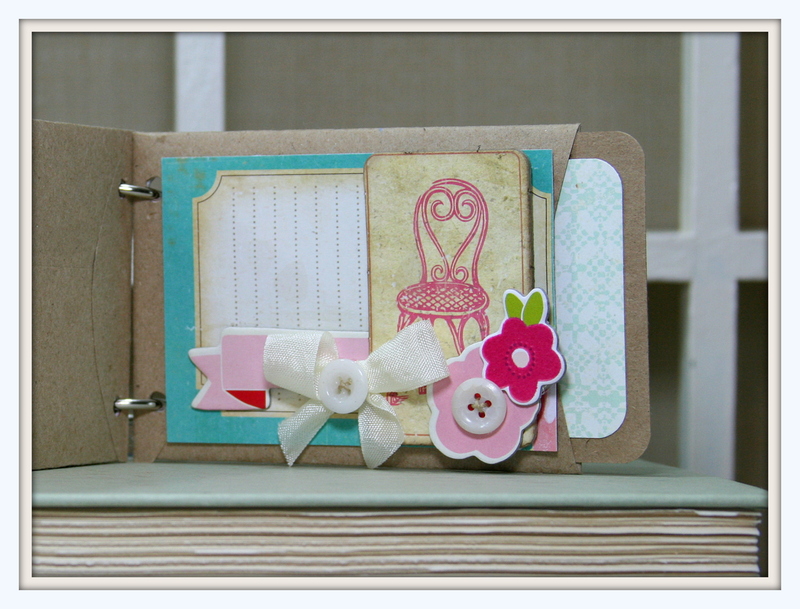 I am loving all the layers and the soft colors! I clipped this special little birdie image from a sheet of Pink Paislee paper. I am convinced every bird should wear a crown. I used the doily to help separate the busy patterns. I layered on a ton of fussy cut pieces so all it needed to finish it off is a super simple bow and buttons. And loads of inking of course. Tee hee. I’ve been wanting to use that post title for a while now. When I found this great image at Graphic’s Fairy I just had to create a wild animal card with all the great layers and embellishments. I used well inked layers of Graphic 45 papers with black borders to create a more masculine card. And of course there has to be buttons! This little flower was fun to make with lot’s of Cricut cut flowers inked in black. Friend Brandy came to play paper and I’m so glad she talked me out of the black Stickle edge I was going to put on it. Believe it or not…I do sometimes agree that less is more. Okay…not really. But a sparkly flower would have been too girly. I added a little twine to this poofy bow. I’ve added a few layers of Graphic’s Fairy images here too…as I thought the zebra was a bit too small to be the star of the show. The ticket makes it more fun and vintagy. Have you ever found just the perfect patterned paper but thought you shouldn’t use it because the colors were a little off? That’s what happened to me with this amazing sheet from Pink Paislee. Everything was right about it…except that the colors were way to sharp and intense for a shabby chic project. Problem solved…I just gave it a liberal coating of Distress Stain in Picket Fence and it brought all the intensity down to a level I could work with. And then I inked it with Walnut ink…because that’s what I do lol. I got this pretty flower effect simply by layering a dimensional sticker with bling, a painted flower and some yummy seam binding ribbon with a sweet little glass topped brad. I used craft paper for my borders, but gave them a coat of the picket fence to coordinate. Three vintage buttons are a must have. 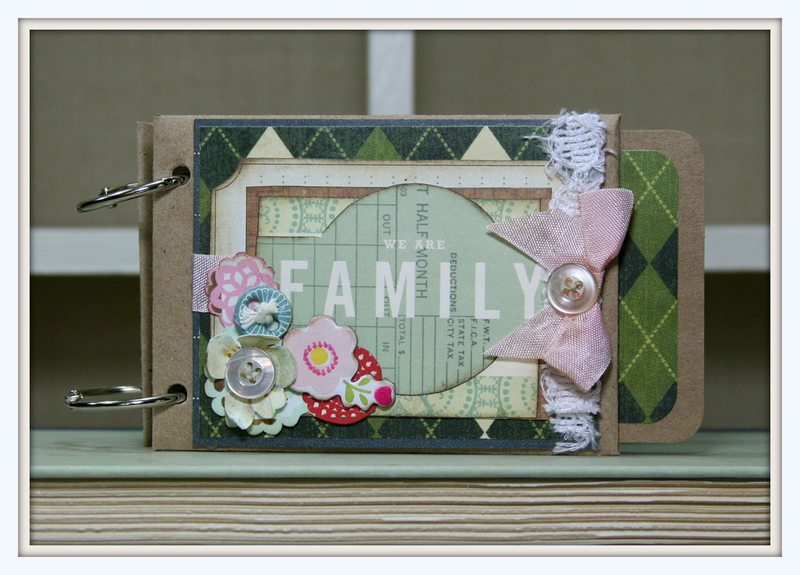 I added two super tiny clips to this lovely vintage image from Graphic’s Fairy. Quite accidentally I used French sheet music and the text behind the butterfly is French too! Just want to wish Kenny a very happy Fathers Day. He has left for the week to take the kiddos to Boy Scout summer camp. I will be missing them greatly and hope they have lot’s of fun and get home safely. Kenny was just given the opportunity to join the Order of the Arrow…an honor for sure and one that I think is well deserved. They spent their weekend cleaning out the camp and planting trees and doing general maintenance to keep the camp awesome for the rest of the scouts to enjoy. They worked very hard and I’m am super proud of them! Kenny mentioned that the mosquitoes were really bad so for his Fathers Day gift…I made him some little bean bags he can spray with repellant and scatter around the floor of his tent. Hopefully this will create a bug free perimeter to sleep in. I also picked up a bar of lemon Grass infused soap from Artistica which I’m told is a natural repellant. 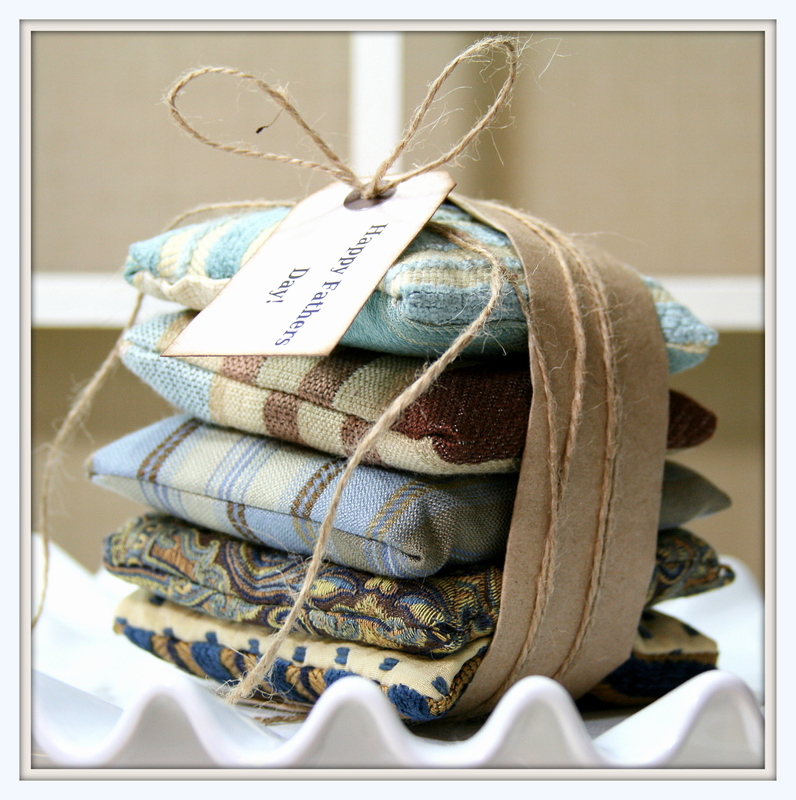 I was able to use a fabric sample book from Ann at Artistica to create the cover for these little bags. A simple wrapping of craft paper and twine with a tag. Lily must have thought she was part of the gift! Or maybe she’s just a camera hog!